Nonprofit organizations have different goals and benchmarks, compared with for-profit organizations - Although profit is not the main objective, the operations and financial management need a proper platform and system none the less. In fact, nonprofit organizations have more complexity associated with their operations, as the bookkeepers need to maintain several account books, handle the funds coming in from myriad sources, and create unique, real-time reports which seldom has any precedence. Moreover, with the advent of digital mediums for fundraising, and the incorporation of ecommerce into the whole set-up, the management of nonprofit becomes even more dynamic, which needs a specialized ERP for best results. NetSuite has developed a comprehensive and robust Cloud-based business management suite for nonprofit organizations, which solves their unique problems with unique solutions. NetSuite ERP and Constituent Relationship Management (CRM) helps nonprofits to integrate their different tools and applications and streamline their every aspect of the business. 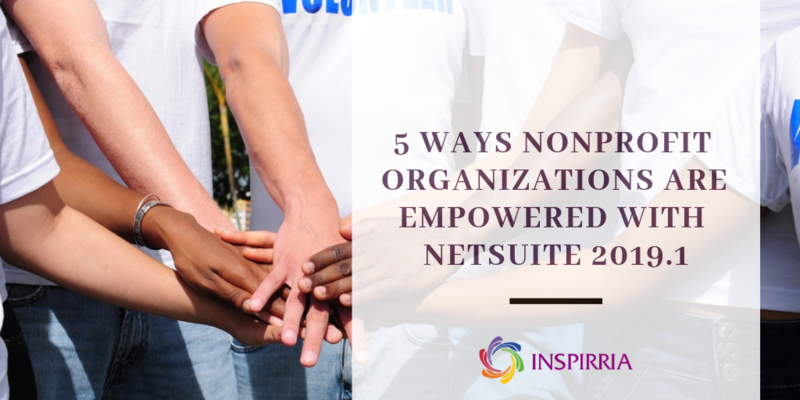 The latest NetSuite 2019.1 release takes the efforts one step ahead, and incubates several interesting features which empower nonprofits, and helps them to focus on their core objective: helping others and making a dent in the Universe. NetSuite 2019.1 release enhances the multi-book accounting feature by adding multiple adjustment books capability. Now, accountants for nonprofts can make edits and additions into the adjustment-only book, based on the primary accounting book. The new updates will allow the bookkeepers to access data from both of these books, which makes the process of accounting seamless. Today, the digital medium is one of the most important arenas for fund-raising. Understanding this, NetSuite 2019.1 has been empowered with 19 unique and distinct extensions for the website owners. Examples include Google Tag Manager, Featured Product and more. Using these, website administrators can easily install additional features, and make their websites more robust and user-friendly. NetSuite 2019.1 focuses extensively on the core HR functionalities, which enables the nonprofit management to track employees' lifecycle from recruitment to exit, to secure employees data, to manage workflow, especially in the countries where wage-laws are strict, and more. These features will help the management to optimize productivity, and handle employees issues in a better way. NetSuite 2019.1 has the new SuiteAnalytics Workbook, which can turbocharge the nonprofit with more data, more insights, and more control. Now, you can visualize the data, and make better decisions using that data. Advanced features such as the creation of intuitive data model, donor-oriented data query, data pivoting and more have been incubated, which empowers the nonprofits with unprecedented control and flexibility. NetSuite knows that data is the catalyst for business transformation, and SuiteAnalytics Workbook does exactly that. Nonprofit work can originate anywhere, and donors can come in from any country. Understanding this need for global acceptance, and global operations, NetSuite 2019.1 has been enriched with support for foreign currency in the expense reports, which makes it a lot easier for the nonprofits. Expenses, payments, donations, reimbursements, advances, payments and every sort of transaction can be now supported in multiple currencies, with real-time exchange rates, with zero dependence on the base currency. Are you a nonprofit which needs consultancy and support for implementing NetSuite? Contact us and kickstart a revolution! © 2018 Inspirria Cloudtech Pvt.Ltd. All Rights Reserved.